>> Bathroom has shower/tub with multiple grab bars (shower chair upon request), sink and 20″ toilet. >> Step stool upon request for assisted access to bed. >> Handicap accessible reserved parking space 50′ from second exterior entrance. Specifically reserved by name of guest. >> No-step access to Breakfast Room in the same building and also Lobby area in next building 75′ from exterior entrance to Chautauqua. >> No-step registration accessibility from handicap parking area to lobby through guest entrance. >> Service animals welcome with validation. 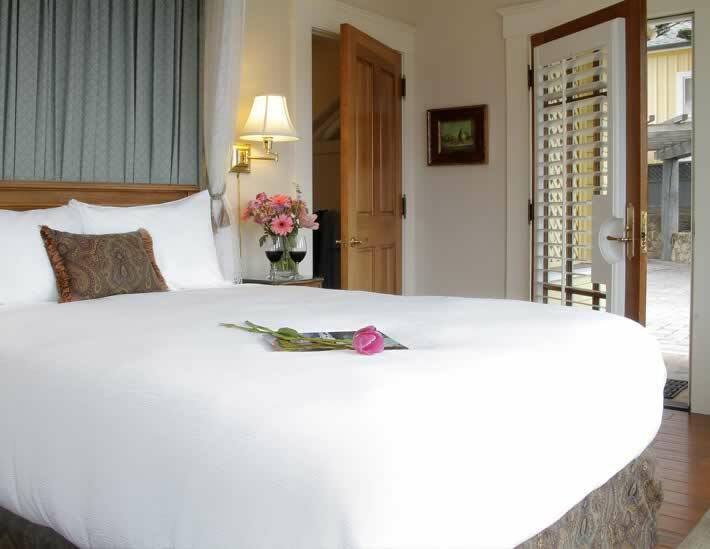 >> Any additional specific questions can be answered by a quick call to Seven Gables Inn at 831-372-4341 between 8am-10pm PST. * Located on the Elevated First Floor on the Southwest Side of the Beach House with a second private exterior entrance. * Please note this room is slightly elevated above the garden level. Guests circulating the inn will pass by this room at the garden level. * This guest room can accommodate 1-2 persons only, including adults and children. This room is suitable for children under 12 years old. Child Liability Waiver signature required.